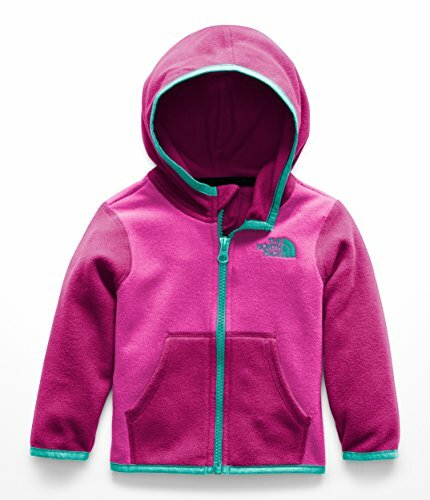 The North Face Size Chart The cozy Glacier Hoodie is just the ticket after a cold day of sledding and shredding. Polartec® Classic 100 is perfect for cool weather layering and the unique microfibers offer an unusually soft hand. The fabric is highly breathable to provide comfort in all types of aerobic activities, it dries quickly to minimize heat loss, and it's pill-resistant. Attached hood extends protection. Full-zip front closure. Raglan sleeves eliminate shoulder seam chafing. Split kangaroo pocket. Embroidered logo at left chest. 100% polyester. Machine wash cold, tumble dry low. Imported. Measurements: Length: 12 1⁄2 in Product measurements were taken using size 6-12 Months. Please note that measurements may vary by size.